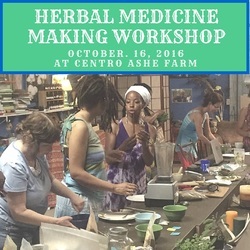 This class will be a hands on day including herbal plant walk around the farm, a foundational background in herbalism and medicinal herbal preparations including tincture making as well as a medicine making medicinal oil and salves. Each student will leave with their own tincture and salve, an incredible beginning to an herbal medicine kit! We will go through folk medicine making techniques and students will have an opportunity to get hands on creating their own medicine! Pre-Registration is required please registered below. Directions ~ Centro Ashé is open to the public during scheduled events only.